All transactions are safe and secure with a reliable history in online purchasing behind each of our associates. 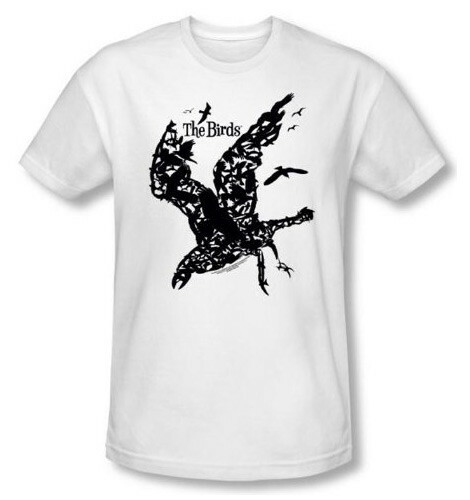 Buy the Birds t-shirt to own Alfred Hitchcock clothing and merchandise. This official Alfred Hitchcock tee features one of his most famous films, The Birds, which was released in 1963. In it, the small coastal community of Bodega Bay is plagued with bird attacks after a woman named Melanie Daniels arrives in town to deliver two lovebirds to the Brenner household as a present. If this story is your favorite, like it is mine, then pair this Birds t-shirt with the Tippi Hedren costume below which is modeled after Miss Daniels' attire. In addition to the Birds tee above, browse the Alfred Hitchcock Clothing Gallery for more apparel like men's and women's clothes, kids shirts or hoodies.